The Warriors lost 26-22 in their second Golden Point defeat in a row in what was their third Golden Point loss in Four Games. 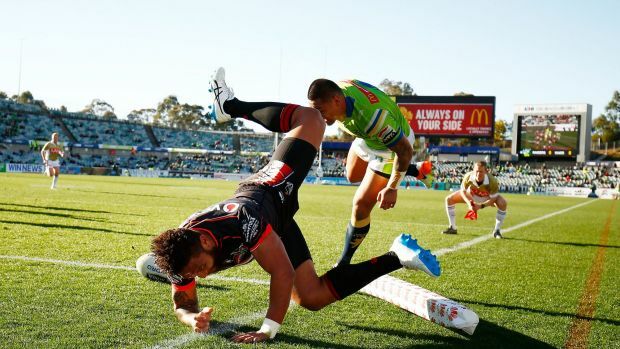 The 26-22 scoreline was flattering for the Warriors as the Raiders were on their way to a large victory until Thomas Leuluai and David Fusitu’a clawed the Warriors back into the game. Unfortunately, the Warriors continued their recent trend and could not close out the game and succumbed to the third try of a Jarrod Croker hat trick. The Warriors showed intent on attack but lacked execution and failed to convert on the chances that the Raiders gave them. The defensive line speed was not to the level we have come to expect in the past two months and hopefully, this is not a sign of the return of the end of the season slide the Warriors presented us with last season. If the Warriors can improve their line speed and start to threaten on attack again, they still will have a chance to play finals football. I believe they need to win at least four of the last six games which with their run home is still manageable. My player of the day goes to Thomas Leuluai. He played his heart out and when the Warriors needed a miracle he brought them back into the game by just simply attacking the line (Which is a subject I am going to mention below). The Warriors are going to miss Thomas next season; he is the settled solid Ying to Shaun Johnson’s Yang. His defense is underrated for a half and whoever is going to take his place next season has a lot to live up too. I’m still not sold on Tuimoala Lolohea being five-eighth next season but I am happy to be proved wrong. My player who needs to improve goes to Shaun Johnson. Shaun needs to get back to attacking the line, my memory may be fuzzy but I do not recall Shaun running even once in this game. When Shaun hits the line he puts the defense in two minds which opens up opportunities not just for him but for the entire team, if the Warriors are to play finals football Shaun needs to step up and return to his attacking form. This week the Warriors return to Mount Smart to face the Penrith Panthers in a must-win match. Both teams are neck in neck in the quest to make the eight. The Panthers always seem to perform against the Warriors so this will be a tough battle. If the Warriors can improve their execution and put pressure on Nathan Cleary the battle will be half won. Andrew McFadden has selected an interesting side with Tuimoala Lolohea moving to fullback with David Fusitu’a going to centre and Blake Ayshford being sent to the interchange. I’m not sure about the side as I like David at fullback and I think having a centre on the interchange is a waste of an interchange spot but will don’t know what Andrew’s game plan is until we witness it unfold on Saturday night. I’m picking the Warriors to win this won by 6 and hopefully we do not witness another Golden Point heartbreaker. Who was the standout player for you? What do you think of McFadden’s 17 for the Panthers game?